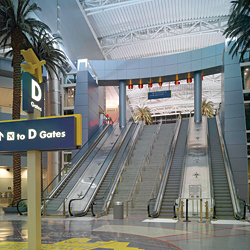 The EcoMod system is designed to fully modernize existing escalators without removing the existing truss or demolishing floors, roofs or building facades. All mechanical and electrical components are removed and the existing truss is modified to fit the company's modules. During the process, passenger flow runs non-stop. It can be used to modernize both the company's escalators and equipment from other manufacturers.